There are some builders who seem to have the Midas touch: everything they create turns to gold. 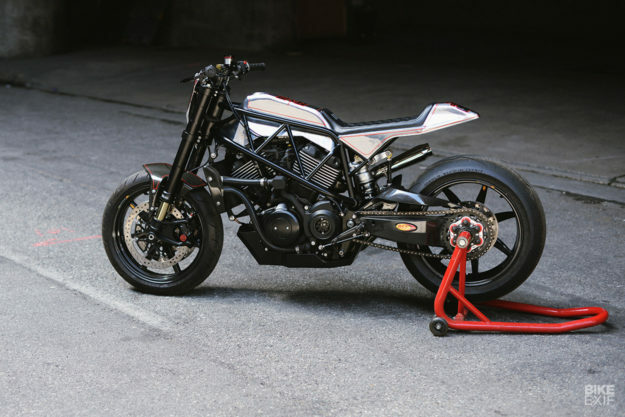 Aaron and Shaun Guardado are in that exclusive group, crafting beautiful racers and customs when they’re not tearing up dirt tracks—or running the Suicide Machine Company business out of Long Beach, California. 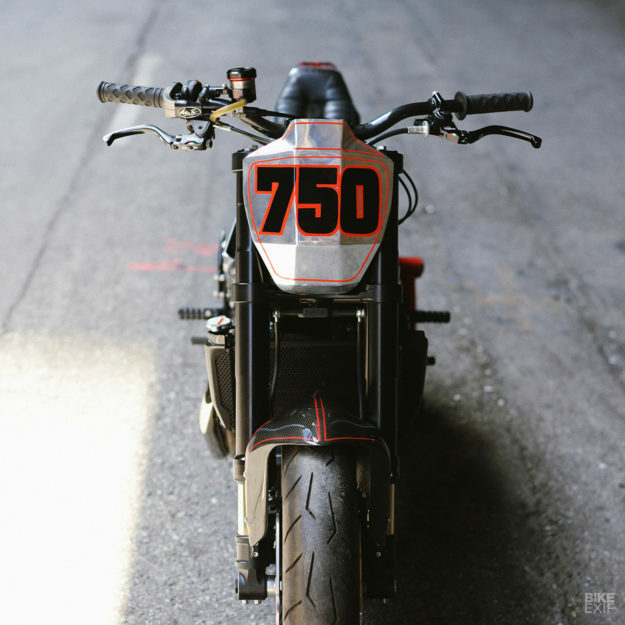 After Harley released the XG platform, the brothers were inspired to pay homage to the road-racing lineage of the famous XR750TT—and also showcase the XG750’s performance potential. 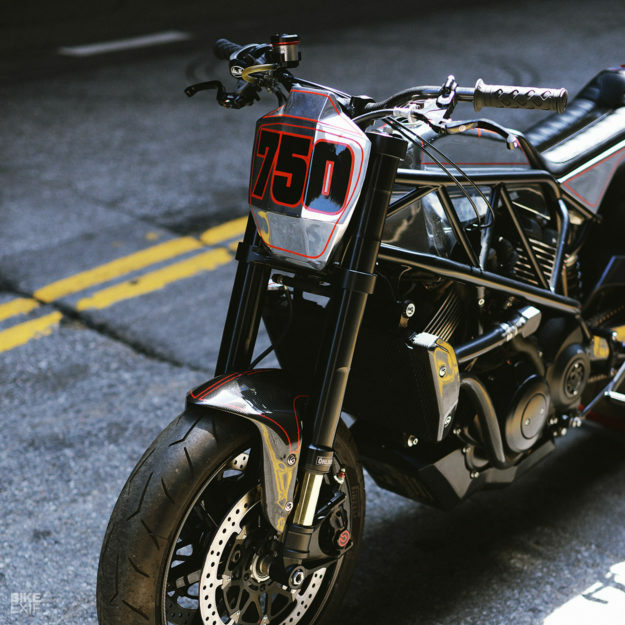 If there’s a Harley that ever symbolizes the ‘art of speed,’ this is it. But the only concrete plan Aaron and Shaun had before firing up the grinders was to use a trellis-style frame. A friend with a genius for engineering helped with the design, and laid out a frame with geometry numbers from both the XR750 and the Ducati 1098. 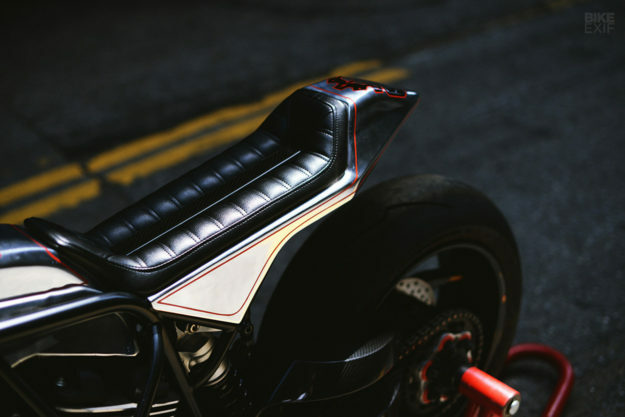 “With the modeling and dimensions outlined in SolidWorks CAD software, we could get started on the actual building of the bike,” Aaron says. “We could have had the tubes CNC-bent and notched, and assembled it like a kit, but for this first bike we decided to manually construct it.” So Aaron and Shaun hand bent and notched each of the tubes for the frame out of 4130 chromoly—choosing the material for its low weight and high strength. The frame tubes were tacked up and welded within a week. 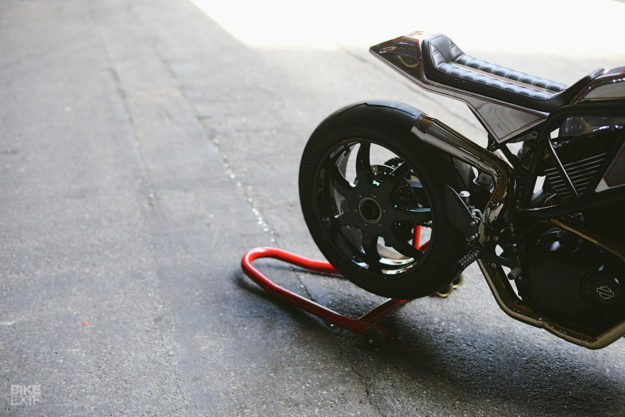 The design included the rear suspension (and single-sided swing arm) from the Ducati 1098, so SMCO bolted on a carbon fiber swing arm from Blackstone Tek. It’s two full kilos lighter than stock. 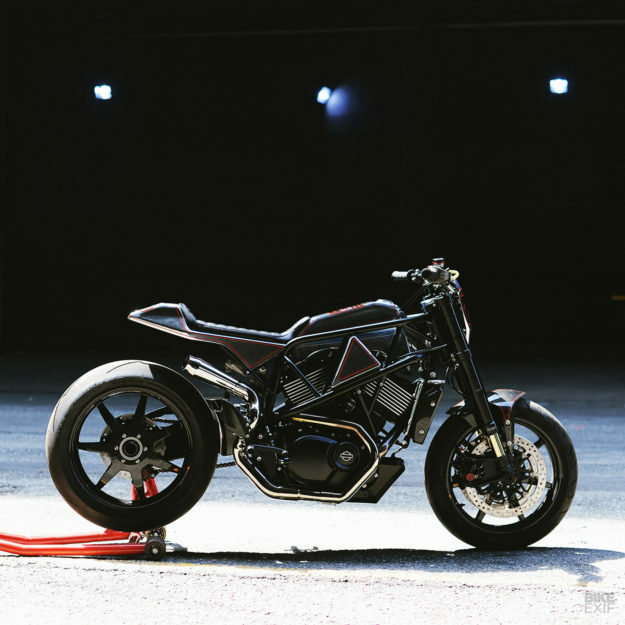 “We paired this swing arm with BST carbon fiber wheels and Öhlins suspension,” says Aaron. “The shock itself needed to be custom built, because of dimension constraints and weight differences between the 1098 and XG750 platforms. With the rear end suspension locked down, SMCO installed a set of shortened Öhlins FGRT301 forks, clamped in new triples trees with a custom offset. Having a Harley power plant in a trellis frame is unique, so the boys didn’t want to hide the lines. 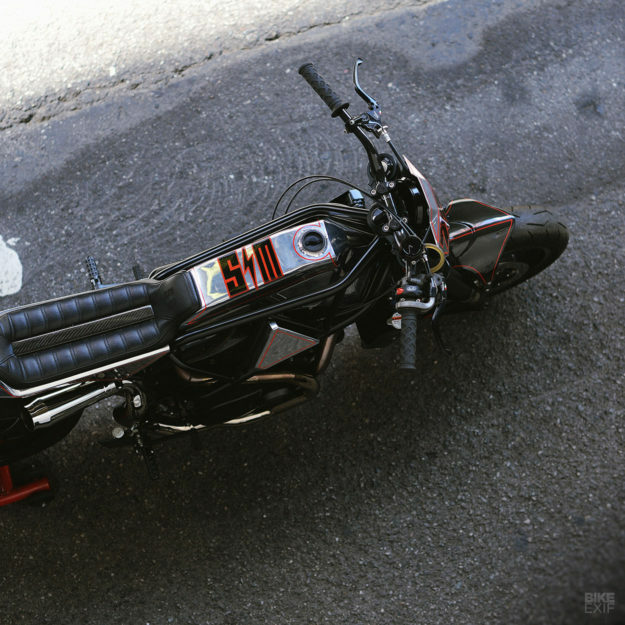 The gas tank was designed after the frame had been completed, and fits between the frame rails and engine. After the major bodywork pieces were completed, one crucial component was still missing: an air intake. “Although small, it took imagination and engineering to get right,” says Aaron. The result is a two-piece design equipped with an integrated K&N filter element. 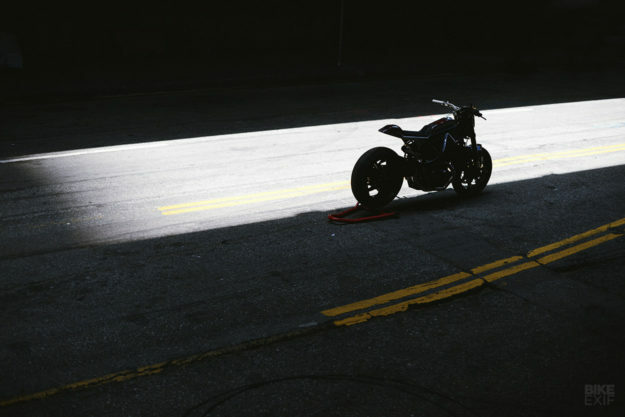 Like everything else, it fits seamlessly without interrupting the lines of the motorcycle. 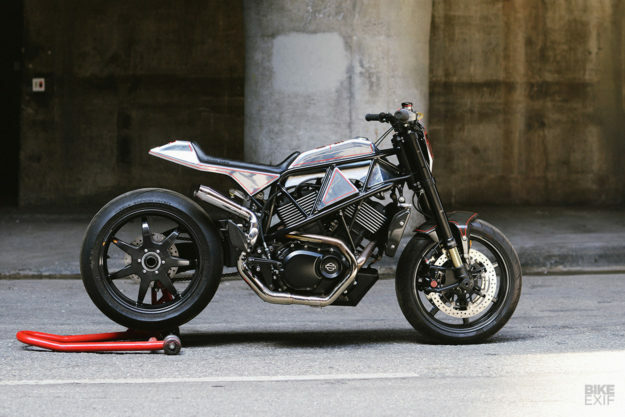 “It was a challenge to hide most of the hardware and the wiring harness,” Aaron admits. But SMCO have pulled it off: this XG750 looks clean and minimalistic. It helps, obviously, that it’s a show bike that’s ready to race. 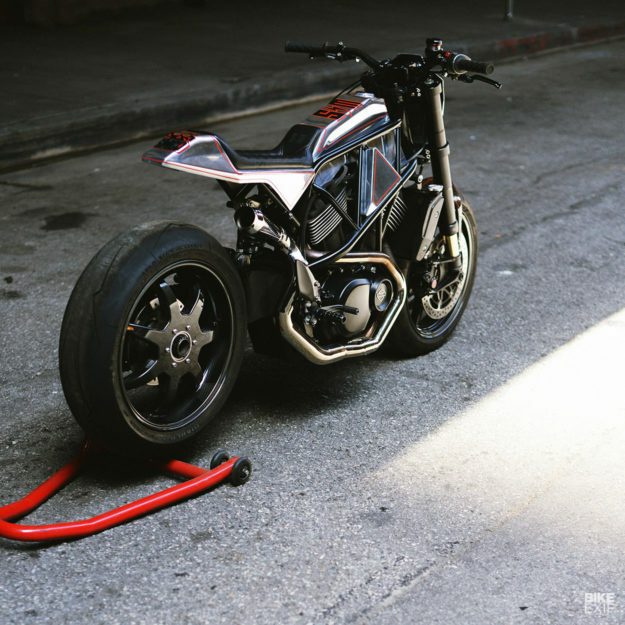 So it doesn’t need the regulatory clutter of a street bike. But the XG750 is water-cooled, so Aaron and Shaun had to find space for a radiator and coolant hoses within the trellis frame. The cooling system was a minor challenge compared to the electronics—which were needed for the fuel injection system and ECM. And the open frame didn’t give much space to hide electronic components. “We needed to find room for a battery, plus the sensors, relays and harness, which are typically stored under the seat area. Which we didn’t have much of,” says Aaron. With the XG750 nearing completion, it was time to tackle the exhaust system. 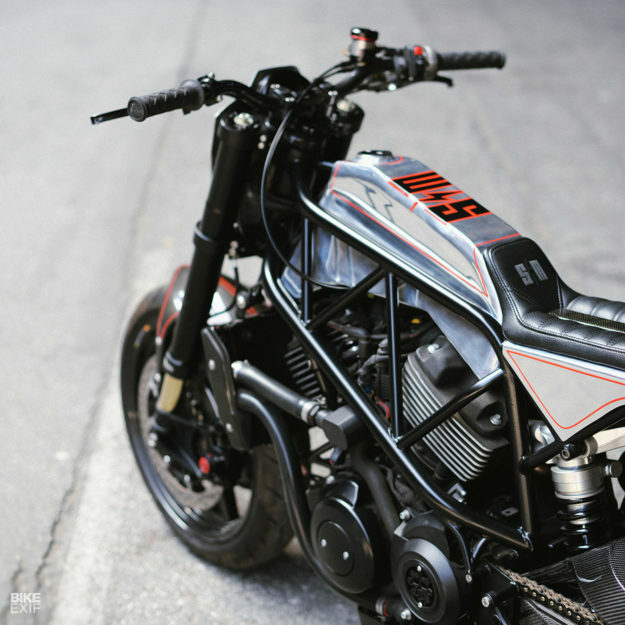 “It’s something that can really make or break a bike. It should complement the other components and flow nicely with the overall lines without ‘taking away’,” says Aaron. The trellis frame and aluminum bodywork are very angular and geometric, so having a swoopy exhaust wouldn’t fit the build. An angular exhaust sounds contrary to common sense, but after a several mock-ups the final design works perfectly. 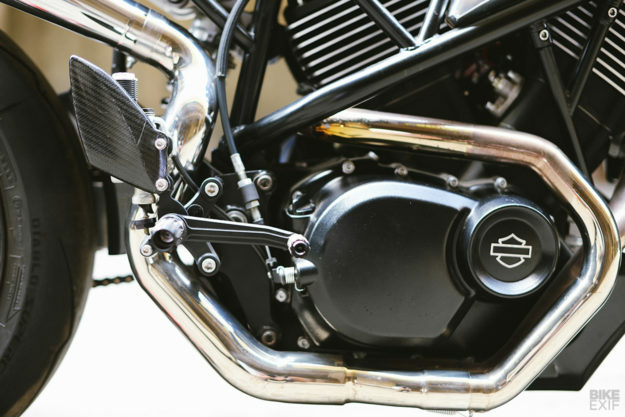 It’s a full stainless system, starting with 1½-inch headers, which step up to 1¾ before going into a collector. The system terminates with a 2¼-inch Burns Stainless reverse megaphone, ordered to spec. 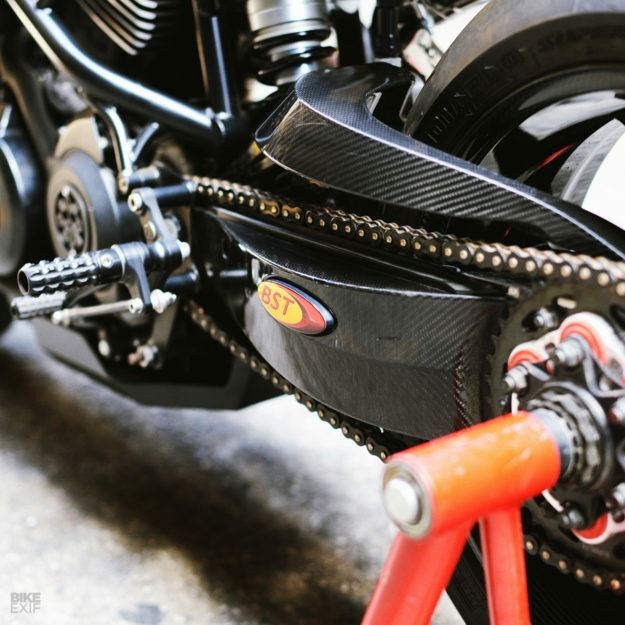 It’s all incredibly high quality work and the finishing details are top shelf too: Brembo brake calipers front and rear, paired with Brembo T-Drive rotors and RCS hand controls mounted on full carbon fiber handlebars. 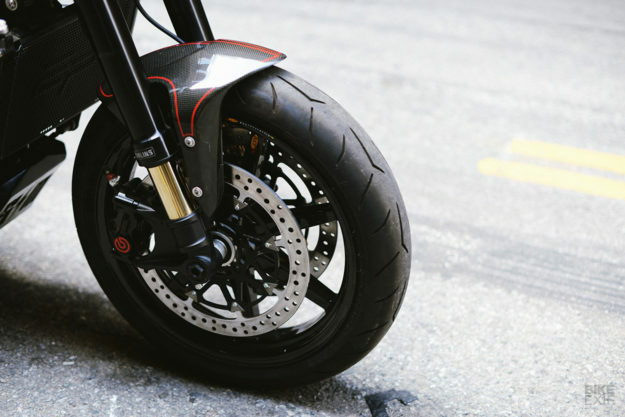 For even more weight savings, SMCO have upgraded the Ducati 1098 cush drive to a Superlite Hyperflex billet alloy sprocket carrier. 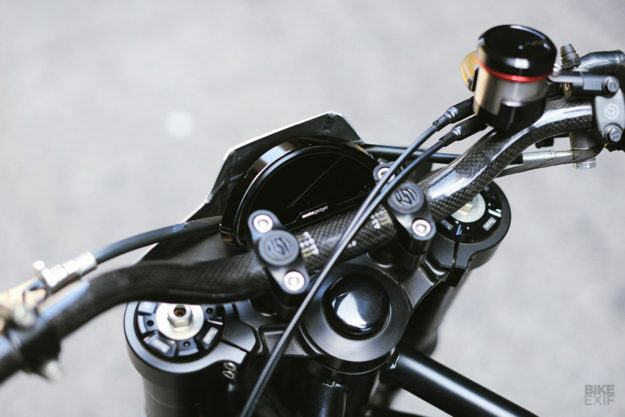 The throttle is a MotionPro Rev2 assembly—with interchangeable throttle cams—to give a smooth, fully customizable power delivery. Aaron and Shaun also fabricated the foot controls, using RSD prototype components that they cut up and mixed and matched. 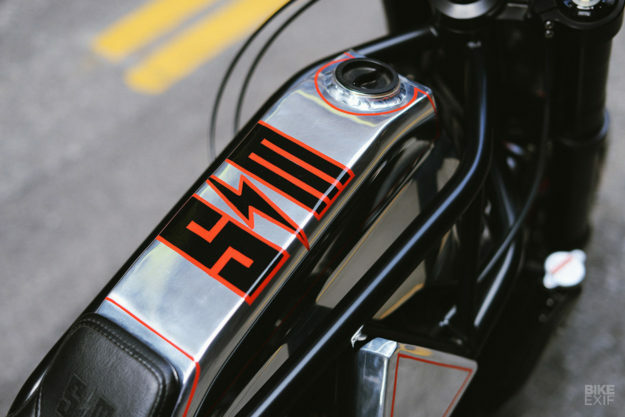 Paint is something that the brothers prefer to outsource, so Pete Finlan from Hot Dog Customs added some discreet pinstripes and branding. We’d say it’s very right indeed.